Continuing from our earlier post on India in October. 2017 was a significant year for Indian telecom during which 4G became the new norm. 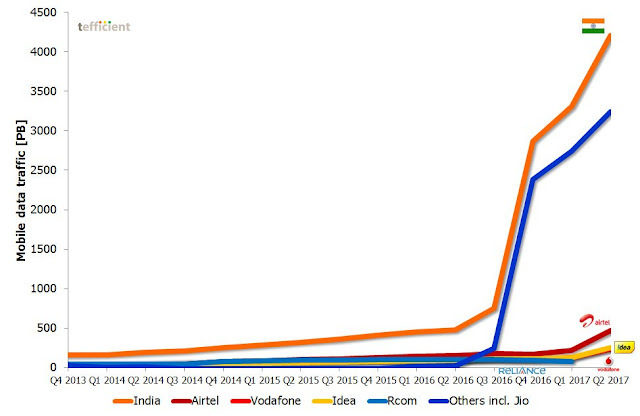 Usage exploded riding primarily on Reliance Jio — the 15-month old network that is already the world’s fastest-growing telco — and the effects trickled down to other operators too. Nearly 4 million TB of 4G data has been consumed by Indians this year, according to a TRAI estimate. Consumers relished swathes of data sometimes “effectively free” and sometimes at incredibly low prices, and hordes of first-time smartphone buyers were inducted into the world of mobile data. The year came to be defined by the stiff price war between incumbent telcos and disruptor Jio. These customers generated 3780 petabyte of mobile data. It's by far the biggest network in the world. The graph suggests that might be around 80% of India's total - Q3 isn't reported by the others yet. 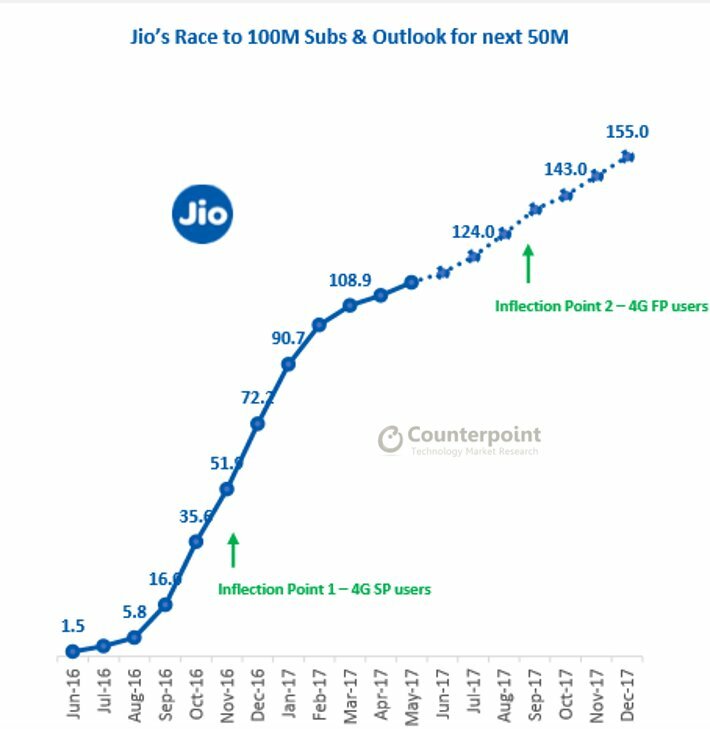 Per subscription, that is 9,6 GB per month which means that Jio might challenge the global usage leaders of the world - 3 Austria, DNA and Elisa Finland and FarEasTone and Taiwan Mobile from Taiwan. Its interesting to note that no only are Reliance Jio's users the highest data consumers in the world, its also driving India's infrastructure building activity. According to the newspaper report below, Reliance Industries has been responsible for 45% of capex spend in India in the last 3 years. The 3G4G Small cells blog has a post on small cells rollout in India here. In addition, Tareq Amin, Senior Vice President, Reliance Jio Infocomm recently spoke in the TIP summit. His talk is embedded below. As we saw in our latest State of LTE report, published in November, LTE availability in India is remarkable: users were able to connect to an LTE signal over 84% of the time, a rise of over 10 percentage points from a year earlier. This places India ahead of more established countries in the 4G landscape such as Sweden, Taiwan, Switzerland or the U.K.
A key reason for the strikingly low speeds is the rapid increase in 4G users across all the networks. As 4G adoption rose, and more and more consumers subscribed to 4G services, the networks experienced congestion, resulting in a decrease in average download speeds across the board. 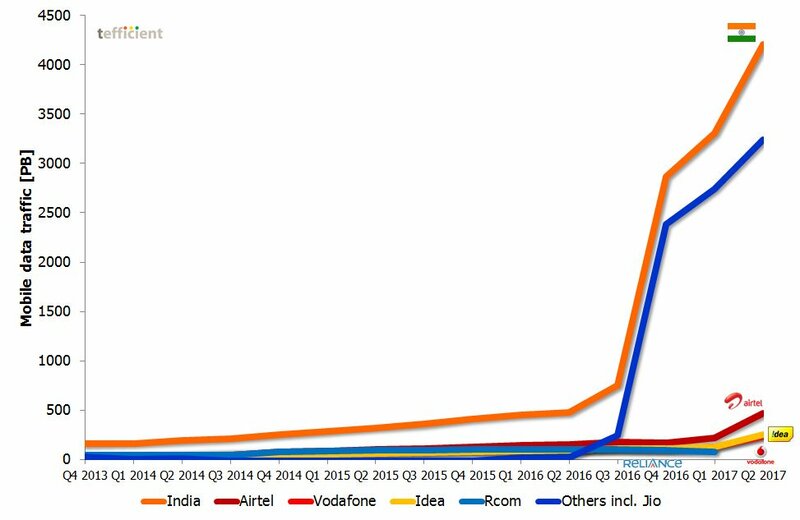 4G users on the networks of Idea, Vodafone and Airtel all witnessed a drop in average 4G download speeds over the course of 2017. Meanwhile Jio trended the opposite direction in 4G speed. In our April report Jio had the slowest 4G speed in our India tests, but as soon as Jio’s freebie plan ended in April 2017, we recorded an astonishing 50% increase in their speed (from 3.9 Mbps to 5.8 Mbps) over the course of six months, which still placed Jio at the lowest end of the speed spectrum but with a significantly narrower gap. When it comes to mobile internet speeds, where 3G and 4G LTE are considered together, India comes in the 109th place in the world according to data collected by Ookla. 2018 may probably be the year India gradually transitions from being a developing 4G country to become a full-grown 4G power.